Did the above pictures grab your attention? Savour more of this artist's work here. Read on to know what Nancy Raj, the illustrator behind some very charming children's books, including Malli and Hanuman's Ramayan, has to say to us. How did you begin illustrating? I began doodling when I was a child. The clean whitewashed wall of my little house was an inviting canvas. I remember making many mad curls, lines, circles, sun, moon, girl, boy, house, apple, mango, flower, leaf and so on. Every Christmas the house would be whitewashed and my mother would warn me not to "dirty" it again. Anyhow I would be at it - I would start with a small dot which later would transform into gigantic flowers. I started illustrating for Tulika Publishers, Malli is my first book with them. How is it when you collaborate with a writer? Do they tell you the style or do they offer complete freedom? The script gives me the feel and complete idea to prepare the illustrations. I send the writer initial scribbles, which gives her/him the idea of how the story will visually flow. Sometimes the writer may have a particular idea/style in mind which I try to adapt into my illustrations. What inspires you? Your favourite authors/ illustrators? Local people and life around are my great inspirations - fussy children, loud hawkers, motorist, over flowing buses, share autos, markets, greasy mechanics, grumpy neighborhood and so much more to watch around. And yes, artworks of other illustrators are inspirations too. My favorite Illustrator/artists are Bill Watterson, Quentin Blake, A.V. Ilango - a Chennai based artist, I love the way he captures local life with his strong lines and colours, very inspiring. How do you go about illustrating? Does one need formal training? If yes, what? I see. I remember. I draw. One doesn't need "formal" training. Simply get to-gether with friends with similar interests. Carry a sketchbook, Paint, Illustrate, go for a photo shoot in your area, browse through picture books. This will help discover many new techniques and skills for illustrating. Some picture books look like computer graphics and some look hand drawn/ painted? Also I have heard of digital enhancement of painted work. What is your take on these? Computer generated or hand drawn does not matter. Any artwork with life and feel will speak for itself. Now technology has improved so much, there are digital tools that can create a water colour painting without water or paints! I use a digital pen and tablet for most of my works, I create textures, pastel effects, impasto methods and much more with my digital pen, without any mess or delay! However, traditional methods are like "grandmom's recipes" that remain special and true always. Without immense practice and experiments using traditional methods, an artist's work will fall flat, lifeless and look plastic. What are the options for illustrators? There are many requirements for illustrators in many growing fields like animation, gaming, advertising, children's education, filming, etc. in print and online media. What are your thoughts on Art Appreciation for children? Art Appreciation is definitely meaningful. It helps a child to think, visualise, understand, concentrate, learn, and respond. Yes, I have illustrated educational material for other countries, where I was asked to capture a particular culture, look and feel, so that children can easily connect with it. I pick information from the internet, movies, books etc. Only the materials and the objects differ, the spirit and energy of the illustration remains the same. It is not enough yet. I'm wishing for more publishers, writers, illustrators, readers, buyers, critics, art schools to emerge and evolve. What is your ambition finally in the sphere of illustration? I want to make many picture books for all ages. I want to illustrate and publish with my own script sometime soon. I want to learn 2d animation, and start animating my illustrations. I want to make real LARGE scale (wall size) illustrations on Indian market scenes. I want to start up a small children's publication company along with my friends. I want to illustrate a picture bible for children in adaptation with South indian culture, look and feel. I want to organize a regular drawing and painting school for children some time soon...and the list is never ending. I spend most of my evenings with my next door little friends (around 8 to 11 years) . I remember helping a little one draw "Cinderella" . The little one finished Cinderella's puffy gown & asked me to draw the shoes. I drew a pair of beautiful stilettos - side ways to show the long pointy heels. At once the little girl slapped her forehead and said " How can any one stand like this?" She erased them quickly and drew 2 simple curves and said " Now look". I am so fascinated by the way children's thought process work Their concept of proportion, colours, shapes, anatomy, logic is so diffrent from how we see it as adults. I wish some day our children will get inspired to instantly pick up characters from Indian tales. Thanks Nancy for a very refreshing chat! Hope all your dreams come true. Nancy has a Master’s degree in Fine Arts and specialization in Graphic Design from Stella Maris College, Chennai. 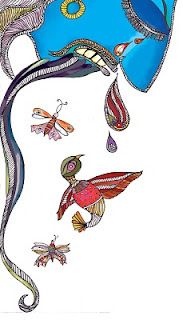 She has worked as a creative visualiser and illustrator with many companies and publications. Her works include- Katha Pubishers: Days with Thaathu, Tulika: Malli, The Village Fair, Aaah vill irundhu Akk varai, Hanuman's Ramayana, Snake and the Frogs, Sesame Workshop India: Educational kits on" Food and Nutrition" and " School" for children. ..She has done projects for NCERT, New Delhi, Oxford University Press, World Health Organization, she even illustrated the Humor coloumn for the in-flight magazine of Paramount Airways. It was during her stint in Chandamama, a monthly magazine, that I got to know her as the illustrator of Ms Shinies and Mister Muthu. All the questions that I would have loved to ask.. I haven't gone through the whole interview yet. But for now a few line, I have wondered how Nancy Raj adapts her style depending on the book. 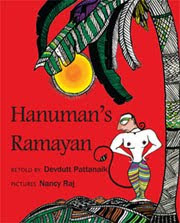 I thought Hanuman's Ramayana was totally different from Village Fair, both very well done and suits the story line. In a hurry now, ta. 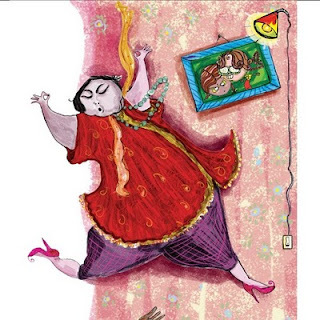 Love the illustrations in Malli - they are so vibrant and full of life, in The Village Fair and Hanuman’s Ramayan. Did not realise its the same illustrator. And Muthu too - Whoa Art! Would love to lay my hands on a copy of Nancy’s market scenes - whenever she creates irt! And the computer generated vs. hand-drawn - ST folks, remember the discussion we had?! Having known and worked with Nancy for the last eight years, it is really inspiring to see how her chalk drawings on the college blackboard keep growing into so many other universes. I love her approach, her ability to imbue life into every work that she creates, and her ability to appreciate the simplicity of everyday life. Keep growing and sharing your wonderful art Nancy! We are proud of you! Nancy I loved what you said about visual flow. In my opinion that's as hard to achieve for an artist as the emotional flow of a story can be for a writer. And I loved your wall-drawing anecdote--as a former child wall-writer, I can relate! Nancy - Loved the interview. For a fledgling illustrator, I loved to hear the words - "One doesn't need "formal" training". Very interesting and inspiring. Like Chox and utbt have said, I wouldn't have guessed Hanuman's Ramayan, Village fair and Malli were by the same illustrator. Loved reading every bit of this, thanks Nancy and Art. Nancy is truly versatile isn't she? We loved both 'The Village Fair' and 'Hanuman's Ramayan' here. In fact, as I have said in this post-http://arightowrite.blogspot.com/2010/05/hanumanache-hanumans-ramayan.html- A could instantly identify the style as Madhubani/Maithil painting. Agree totally with Nancy regarding life around you being a major source of inspiration- for any creative pursuit. Great interview as usual, Art. Enjoyed the interview thoroughly. Very interesting questions and very inspiring responses. Art, thanks for this wonderful interview !! I realise that I hardly have any Katha and Zubaan books unlike Pratham, Scholastic, Tulika. Great interview Nanc, iloved the way you aproched it. as inspiring as always.art with a lot of life and energy -that speaks for itself,don't think it need smuch of a script. well done!! I have that book and will be posting the review of it soon. Wonderful, exciting n full of life!! just like nancy raj...truly a pleasure to read! Interesting interview.I really wish such off beat profession was publicized well in those days. I am sick of people wanting their kids to be engineers and doctors.There is so much more to do in this world and Nancy Raj shows it in her works.well done, bravo chennai gal! Thank you Shruti, Nanands, Utbtkids, Choxbox, Srivi, Uma K, Satish, Arundhati, sandhya, tania thomas,Vibha, Tejashri, Arunkumar and Lavs! The patting feels too great! Art, I totally love your saffron tree! 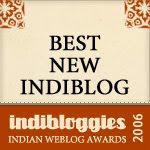 Keep visiting...We are 15 reviewers here and the link you sent on Days with Thaathu is also a contributor here- Vibha!! and looking forward to your realising your dreams!! A very delightful interview, Nancy and Art. Bubbling with energy! Couldn't agree more with your views on the scene of Indian picture books. Yes, we need lots and lots of them...err, not just for children, for the grown-ups too! 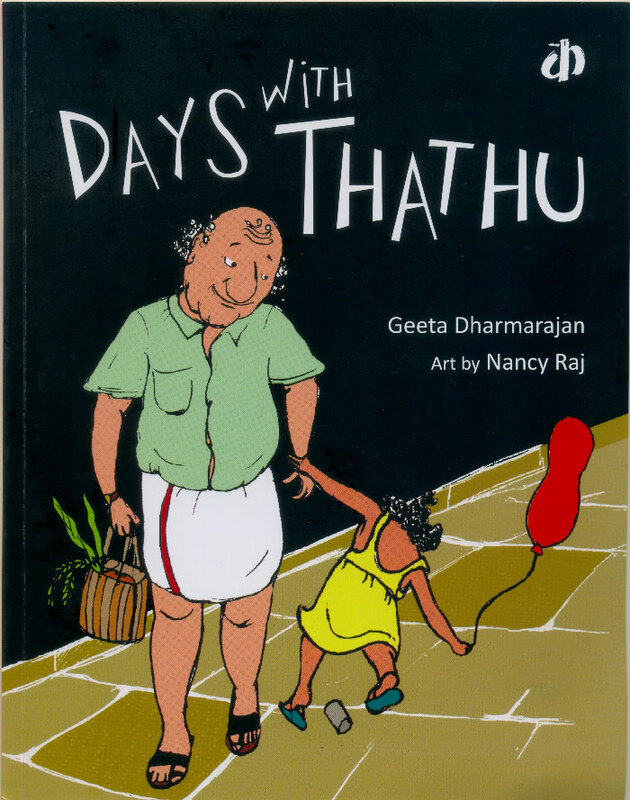 :) ) And please also some wordless picture books that can speak to children all over India and the world!! Best wishes to you on all your projects, especially on starting an art school for children. Sounds great! I am definitely bringing my girls over to you while in Chennai for some art gyan. And please let us know if we can be of any help. Thank you again! Nancy's work lifts the books she does to a whole new height! Real Art, I mean. Highly inspiring, please forgive the pun. Cant agree more Praba and Ashok! !